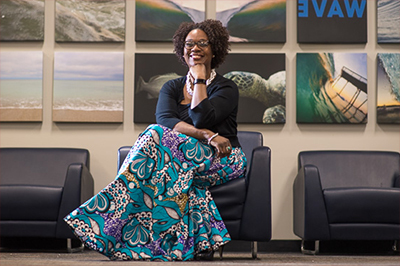 Sabrina Cherry, assistant professor of public health studies, believes an integral part of teaching is being a lifelong learner. Her first job after undergraduate school was serving as a health extension volunteer in the U.S. Peace Corps in Gambia, West Africa. NEW: UNCW Women's Studies and Resource Center, CARE and Local Nonprofit Athenian Press Present "The 7+ Deadly Sins of Being a Woman"
Submit items for SWOOP by noon Friday. 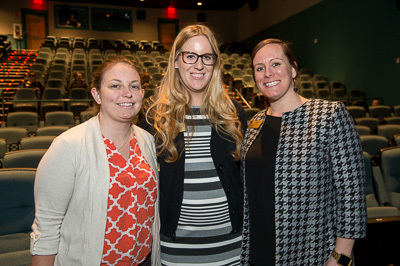 Past Staff Senate chair Lauren Auton is pictured with current chair Megan Allred and chair-elect Jordan Calfee at the Staff Senate Spring Forum on March 8 in Lumina Theater. The forum was an opportunity for staff to share and discuss key topics of interest.